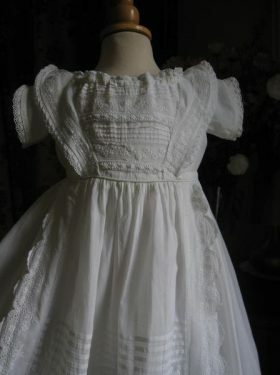 Welcome, to one of the most exciting collections of bespoke christening gowns, rompers and accessories within the UK. 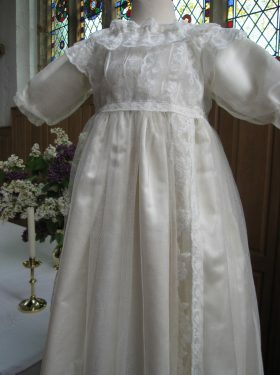 Step inside the world of leading christening gown designer Linda Patrick and discover the delicate workmanship of all her christening outfits. 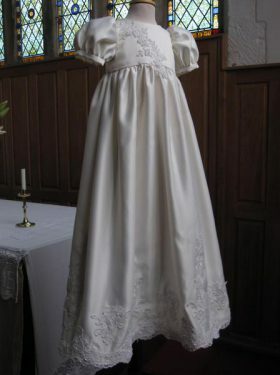 Your wedding dress is sentimental to you and your wedding day. 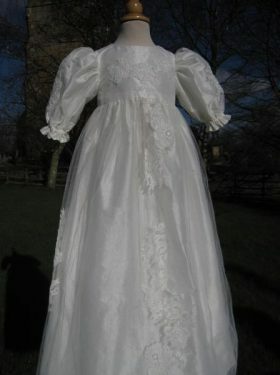 It is therefore a perfect choice to use to create another special outfit for another special family day. The Bespoke Collection features some of Linda's finest work. 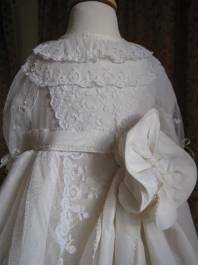 With a reputation for creating exquisite personalised hand embroidered gown, these really are family heirlooms to treasure. 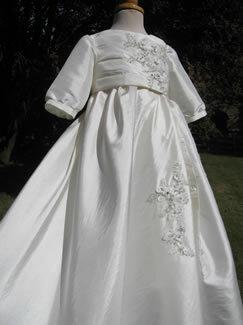 Please take a look at the Jemimah Christening Gown for girls and the Lewis Gown for boys to see the latest examples. 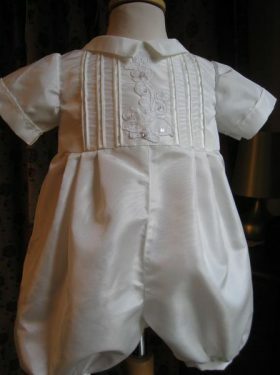 New for 2015 is the Hamish Christening Gown/Romper, featuring a beautiful hand embroidered thistle from a Victorian pattern. 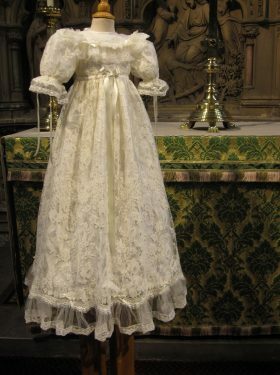 If your christening gown has aged or is in any other way diminished or damaged, Little Doves can lovingly restore it, and in most cases, bring it back to its original colour and beauty. 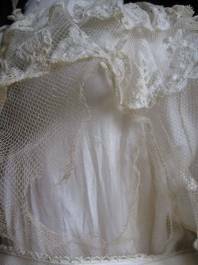 "I can't thank you enough for making our family heirloom last for many more years to come. Thankyou so very much"
Linda has an impressive client list. 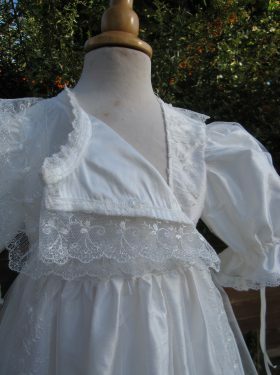 Her creations have been endorsed by Vogue Magazine, Prima and Country Living magazines. And in 2012 her work was featured in the BBC drama, The Paradise. 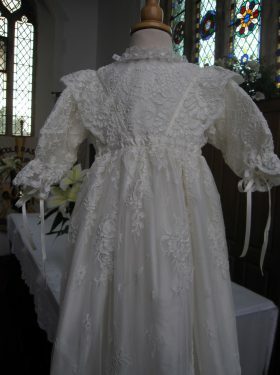 Linda has also created a new gown for Earl Compton of Castle Ashby as well as being entrusted to renovate the original. 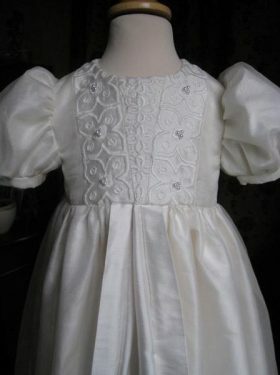 Also, in celebration of the popular series Downton Abbey, Linda has created the Amelie Christening Gown. 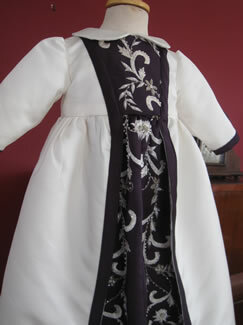 With her talent for creating perfect antique reproductions this Edwardian style robe is stunning. 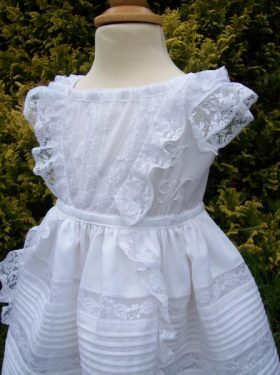 Now well established is the stunning range of Scottish Clan christening gowns, rompers and accessories delicately hand embroidered with Clan Crests, Coat of Arms or Shields. Our latest edition is the Rhona Gown featuring tartan and the Scottish thistle. 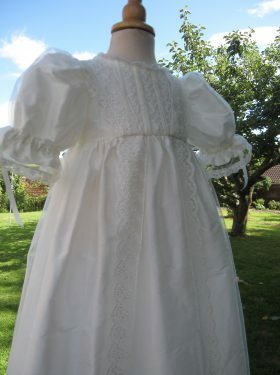 Little Doves prides itself on creating the most beautiful christening outfits for babies, whether you chose from our selection of silk or lace christening gowns for girls, traditional rompers for boys or one of our delightful caps, bonnets or booties. Please enjoy your visit to this site. We hope you will experience a flavour of what Little Doves can do for you. 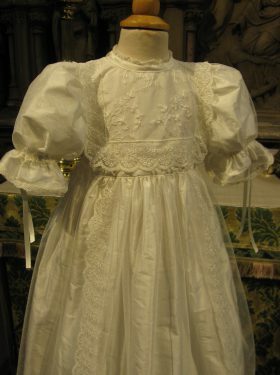 Then, please contact us to discuss your dream christening outfit.